Where are we getting our real news from in these past times, especially about the two long running occupation theaters we have our soldiers engaged in? I would suggest we're getting a better look on these conflicts, and other real news, from local outlets and not the so called National Media Cable Outlets, which seem to give more talk, from so called experts and analyst, singular opinion, than real news reporting, with the occasional mini doc thrown in. I did a post yesterday on Veterans and the problem of Homelessness within our community of brothers and sisters, all the video's and links were from local outlets, or individuals. Same a few days prior to that after the tragic incident at the stress clinic In-Country in Baghdad. These were also local outlet reports and investigations on the stress of War and Occupation and PTSD possibly playing a major roll in what happened. 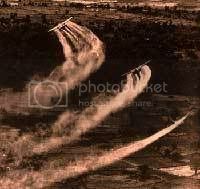 During the Vietnam War, the U.S. dropped millions of gallons of Agent Orange, a toxic defoliant, on Vietnam in an attempt to remove the jungle used for cover by communist forces. Decades later, civilians still suffer the consequences. Dioxin still lurks in Vietnam’s soil, causing deformities which are passed on from generation to generation. It just never stops. Does disrepect to our veterans know no bounds? When Soldiers Return from 'Wars Of Choice'! This is just one result of the Apathy after the Cheering and Support of! Read more about When Soldiers Return from 'Wars Of Choice'! Washington denies responsibility for the effects of chemical warfare, fearing that legal precedent may limit future military endeavors. Long after the last bullet has been fired in a war, unexploded bombs, landmines and toxic chemicals continue to maim and kill civilians. This is particularly true of the Vietnam war. Three decades after US soldiers and diplomats scrambled aboard the last planes out of Saigon in April 1975, the toxins they left behind still poison Vietnam. Relations with the United States have been normalized since the 1990s, but the denial of justice to the victims of Agent Orange remains a major bone of contention. Not only are Vietnamese still maimed from treading on unexploded bombs, they are also victims of this insidious scourge that poisons water and food supplies, causing various cancers and crippling deformities. Eighty million liters of Agent Orange were sprayed on the jungles of Vietnam, destroying swathes of irreplaceable rainforest through massive defoliation and leaving a toxic trail of dioxin contamination in the soil for decades. The legacy of this chemical warfare can even be inflicted on the unborn, with Agent Orange birth deformities now being passed on to a third generation. Below you will find abit about the History of this Planet that makes for such a turbulent World to live in, from one of the many sites, found on the web and before that, and still, in the many history books written to supposedly help us humans remember and not repeat the failed policies and actions of the past. These track the importance of what man does, the failures and the recognition, leading to the actions, or lack of, of many trying to right the wrongs to bring about a better World to exist in and leave a better World for those that follow.